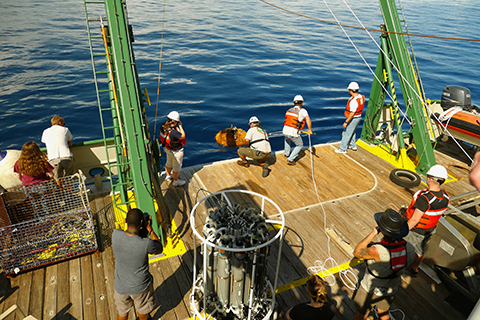 Housed in the Department of Ocean Sciences at the Rosenstiel School of Marine and Atmospheric Science, conducts a spectrum of experimental and numerical studies of coastal circulation processes and ocean-atmosphere interactions during hurricane passage. One important focus is to understand the role of the upper ocean on sudden hurricane intensification changes using a combination of satellite, aircraft and in situ measurement and analysis techniques such as oceanic heat content. The laboratory provides a forum for scientists, students and local communities with critical resources relevant for the continued state-of-the-art study of tropical storms. With three decades of solid research experience, scientists and students exchange ideas with common interests in this highly relevant societal theme. Research at the Upper Ocean Dynamics Laboratory is generously supported through the following funding agencies.